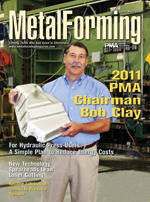 Bob Clay, PMA Chairman for 2011 and CEO of Pridgeon & Clay, Inc., pledges to guide the association on a mission to become an essential partner, by developing core offerings for its member companies augmented by cutting-edge products and services that businesses deem essential. The return on investment for outfitting a hydraulic press with a variable-frequency drive (VFD) shortens the more a metalformer pays for electricity, the more said companys hydraulic presses sit idle waiting for work and the bigger the press motor. Many VFD installations pay for themselves in two years or less. An Alabama contract fabricator of pneumatic conveying systems, ductwork and other sheetmetal and plate products trades up to the state-of-the-art in laser cutting and has increased throughput and significant cost savings to show for it. ...help dies live a long and healthy life.